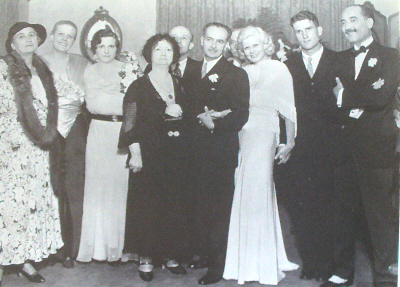 It's that time of year again, when we remember the birth of "Our Baby" Jean Harlow, a.k.a Harlean Carpenter and this year's anniversary was marked with a very special get-together in Beverly Hills. The spectacularly warm and sunny day however was not entirely focused on the hereafter. It was very much about the here and now. It was great to see so many familiar faces of friends I've met thanks to my interest in Harlean: Harlow historian Darrell Rooney, Reg Williams, Mark Vieira, Karie Bible, Scott Michaels, Ron and Maggie Hale (owners of the Paul Bern house on Easton Dr.), Cliff and Janet Gooding (owners of Jean's 1932 Packard, which they drove to the event, thank you so much! ), Skip O'Neil, Bill Forbriger, Jackie Haskins and of course the Chandler family. It also featured some virtual "six degrees of separation" meet ups between Harlow enthusiasts who until that day had only known each other via the Internet. For my own part, it was a complete thrill and joy to finally meet Sharon Barnes and her lovely daughters Briony Barnes and Mallory Morton from Kansas. We first connected around late 2000 or early 2001, when Briony was a teenager exploring her Jean connection online. The wonderful Barnes family is related to Jean on the Carpenter side of the family. Sharon's great-grandfather, Earle, was the brother of Jean's father, Mont Clair. 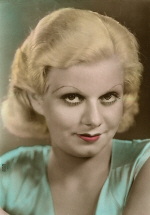 Their website at JeanHarlow.info is a must-bookmark for anyone yearning to learn more about Jean's often overlooked paternal heritage. Left: Jean photographed on the front porch of her Club View Dr. home; Right: her cousins Sharon and Mallory photographed on the same spot 70+ years later. Above: Jean photographed on the stoop of her home; Below: Briony strikes identical pose there on Sunday. Another first face-to-face meet up for me was with Jim Kaufmann, a Harlow collector and historian from Massachusetts. This was a complete and total surprise to meet him on Sunday, having no idea he was flying in. I'm still kind of in shock and wishing that we all had more than just a few hours together. I think I met Jim online when I first started The Platinum Page, he was one of my earliest regular readers. He's also a great writer. Be sure to read his fascinating May 2006 article "The Hunt For Harlow." Special kudos to Darrell Rooney as well, who had a big hand in making the day special on so many levels - in particular by providing the numerous historical MGM publicity photos from his equally vast photographic archive, taken of Jean during her stay at the Club View house and including quotes that spotlighted her upbeat and friendly personality, as well as what was important to her in life. These are just a few highlights from a very memorable day in honor of Jean and the friendships shared between everyone in attendance who care about her. I only wish every devoted Harlow fan I know could have been there, and there are many, many of you out there. You were there in my heart in spirit. I was so busy gabbing with everyone that I didn't take as many photos as I usually do, but the ones that did get snapped may be viewed on my Flickr Photo Album of the day. I'm looking forward to reading stories from other attendees to learn more about their own personal experiences and recollections. My heartfelt thanks to the Chandler family for once again welcoming me into their home and sharing Harlean-inspired moments. It feels so good to know how much you enjoy this house and that it's truly a home where the best of Jean Harlow is remembered and appreciated. Most of all, thank you and Happy 98th Birthday to "Our Baby" whom we all felt present in one way or another on Sunday. Bathed in the sunlight that Jean herself enjoyed while living in the Club View residence. Photo by Jim Kaufmann, who saw the moment and captured it so nicely - Thanks, Jim! Monday, July 2, marked the 75th anniversary of Jean and Paul Bern's wedding. Of course, their union was tragically short-lived, but that's a post for Labor Day. The 4th of July holiday is a time to recall happier days. Many thanks to Dr. Charlie for his incredible hospitality! He and his family purchased the home in 2005 and I'm happy to report that they truly appreciate the Harlow-historical significance of the place they now call home. I took some snapshot that day but for privacy reasons will be keeping those off-line for now. I hope to file a more in-depth story about Dr. Charlie, the Club View house history and to show-and-tell you more about the interior in a separate post later this year. Speaking of Harlow houses, I'm sad to report that my friends Mark & Nancy have completed the sale of Jean's (well, their) Palm Drive home. They will be leaving soon to be nearer to family in South Carolina and will be greatly missed. Mark & Nancy threw a "last hurrah" party there on June 6th to say goodbye to friends and also to honor Jean on the anniversary of her death. 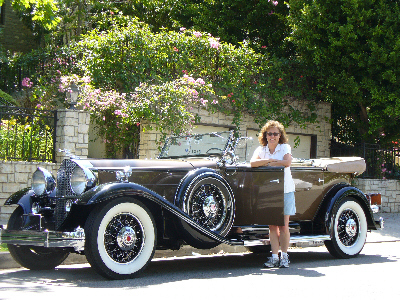 It was an incredible evening, highlighted by the appearance of Jean's 1932 Packard, courtesy of its current owner, Cliff. I doubt that any previous owners of the Palm Drive cared about Jean as much as Mark & Nancy did. While there was a tinge of sadness in the air, realizing how sick Jean was during her last hours in the home, but there was also a lot of love generated that night. I choose to believe Jean was there in spirit, and appreciated the festive way in which she is still remembered and loved. Yes, it was an honor and a thrill to be able to visit with Mark & Nancy inside the last house Jean lived in, it was incredible to stand in Jean's room for the first time and visualize how sad it must have been back then, but what I will truly miss is the opportunity to spend time with this wonderful, generous and fun couple. 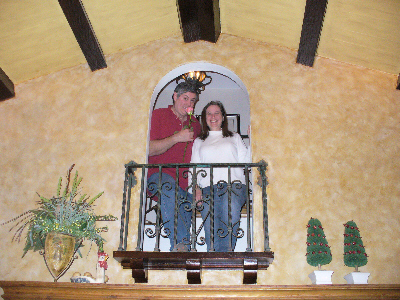 Happy landings in your new home, Mark & Nancy! I look forward to your return visits to Los Angeles. 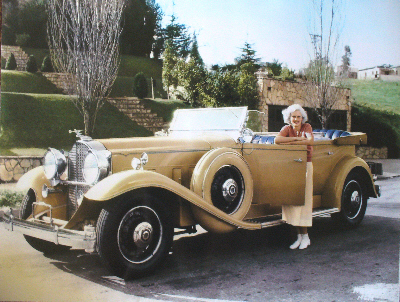 The car, which is in pristine condition and purrs like a kitten, has been repainted since Jean's day when it was cream-colored. It's been seen by fans over the years at car shows and at the Petersen Automotive Museum in Los Angeles. Cliff told me it's even been to Paris! It's a beauty.